This week off was exactly what the doctor order. It gave me the time I needed to hit the reset button and feel re-inspired about my passions and specifically blogging. During my r and r time, I found myself gravitating to learning more about skincare and researching makeup routines. I've heard a lot about Dr. Jart, and this week, it is one of my top currently craving items for the week. 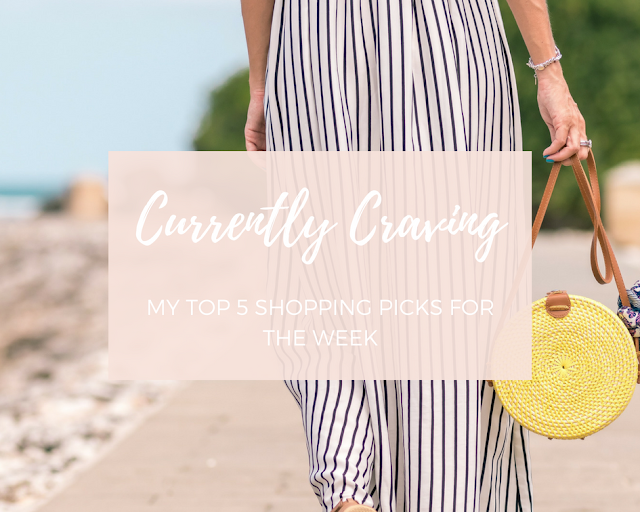 Keep reading below for my top 5 picks of the week! 1. // Covergirl Flourish Mascara: I'm always on the hunt for a mascara that will make my lashes long, full and won't clump. Sounds like a pretty tall order, but I've hear that Covergirl's new Flourish mascara will do just that. 2. // Straw Boat Hat: I've been on the hunt for a "cool girl" hat for quite sometime. Problem is, I have a huge head, so it is really hard for me to find hats I like. This one from Shein looks like it could just what I am looking for! 3. // Dr. Jart Sunscreen: Living in one of the sunniest state means that my face and skin needs to be armed with sunscreen at all times. That means driving, running errands and laying by the pool. This Dr. Jart's sunscreen is top on my list. 4. // Straw Bag: I have been seeing the straw/wicker bag trend everywhere, and honestly, I'm still not sick of it. It is the perfect bag for summer and can be paired with denim cutoffs or a striped dress. This bag from Target is affordable and adorable (win, win). 5. // Rose Hydration Pouch: So you know that rule that every pool has? You know, the one that says "no glassware allowed." Well, this rosé pouch gets your wine into the pool without the annoyingness of plastic open containers. Alright, so now it's time to pool party.